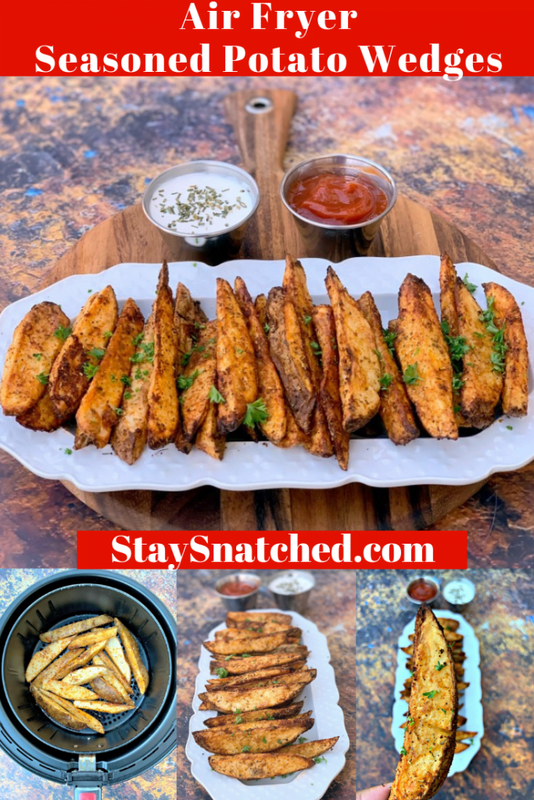 Easy Air Fryer Seasoned Potato Wedges is a quick and healthy recipe that uses fresh-cut russet potatoes, Herbes de Provence seasoning, and smoked paprika to produce crispy potato wedges with a soft interior. You can use your Power Air Fryer XL, Nuwave, or any brand for this dish. If you love KFC wedges or homemade French fries, you will love these! You can also use red potatoes or Yukon gold. 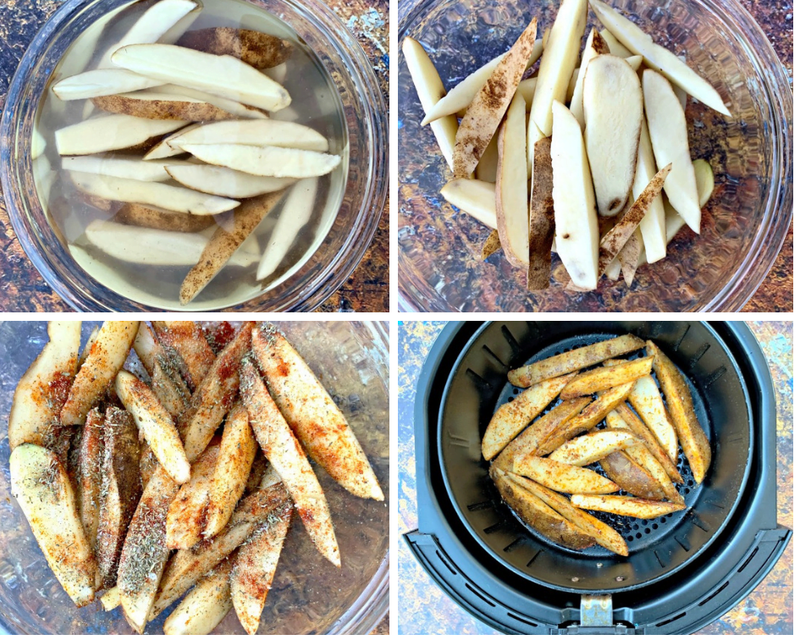 If you have ever made my Homemade Air Fryer Fries or Air Fryer Sweet Potato Fries, then you understand why I needed to throw potato wedges in there, too! 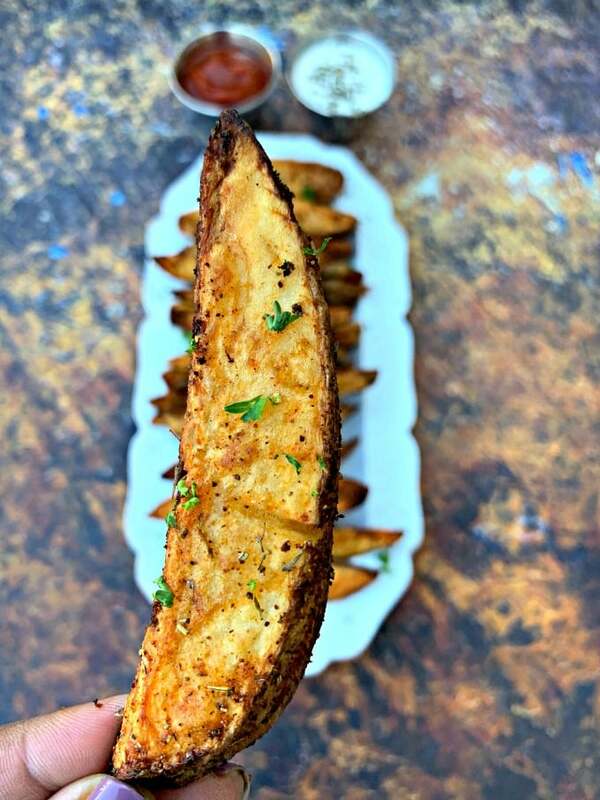 These wedges are pretty easy to make. I love to load them up with seasonings! 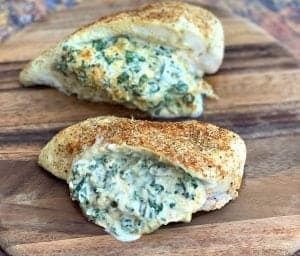 Pair them with an Air Fryer Cheeseburger or Air Fryer Breaded Chicken Wings! First, decide which type of potato you would like to use. I feel russet potatoes work best for potato wedges. Feel free to use what you want. Rinse and scrub the potatoes really well. I like to use this veggie wash from Amazon. 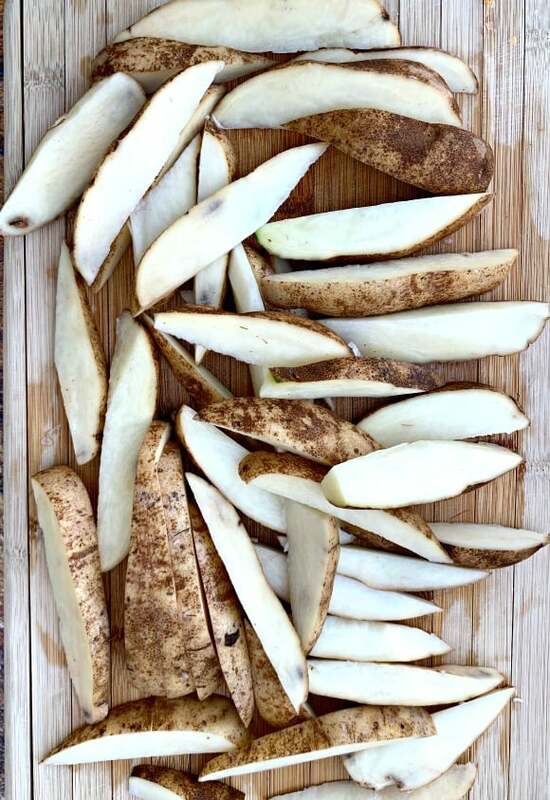 Cut each potato in half lengthways, then cut the potato on the diagonal to make 8-10 wedges per potato. Try to make sure they are about the same thickness and size. Add the potatoes to a large bowl with hot water for 20-30 minutes. Pat dry. Add the olive oil and seasonings. Use tongs to properly coat. 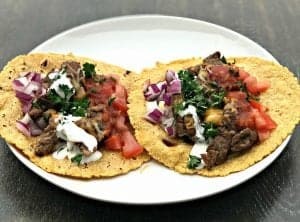 Air fry for 20-25 minutes. I like to cook mine for 25 minutes. I recommend 20-25 minutes, flipping halfway through. 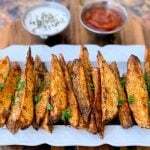 What Temperature Do You Cook Potato Wedges in an Air Fryer? I like to use 400 degrees. 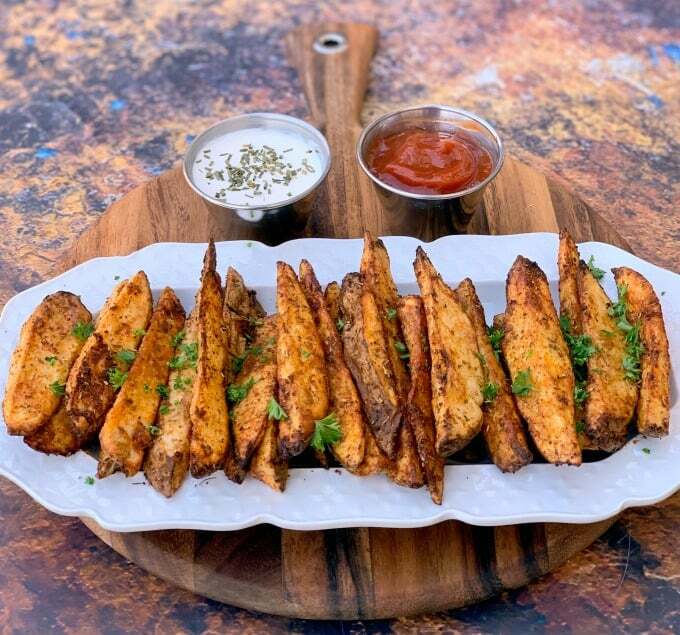 What Seasoning Do You Use for Air Fryer Potato Wedges? 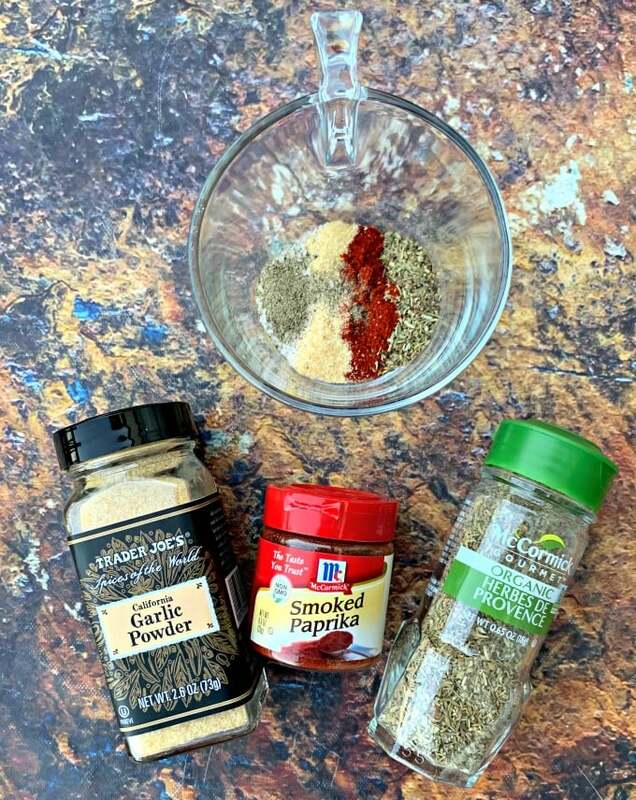 I love to use Herbes de Provence, smoked paprika, garlic powder, salt, and pepper. Herbes de Provence are dry herbs that are frequently used in South of France, such as thyme, rosemary, oregano, etc. Check out this article, Inside the Spice Cabinet: Herbes de Provence. Smoked paprika will give the potatoes a mild smoky flavor. You can learn more about it via this article, Inside the Spice Cabinet: Smoked Paprika. And do not forget the salt and pepper! Russet potatoes are very bland. You really have to doctor them up, which is why salt is key. I prefer to use kosher salt. 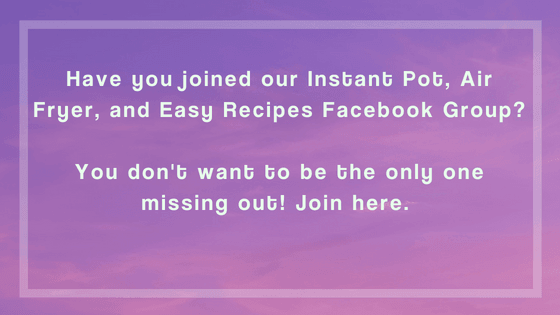 You can follow the same instructions for sweet potato wedges. Frozen wedges will need 25-30 minutes using the same cook time. Here’s an Easy Aioli Recipe that will pair with the wedges. Save the recipe on Pinterest here. 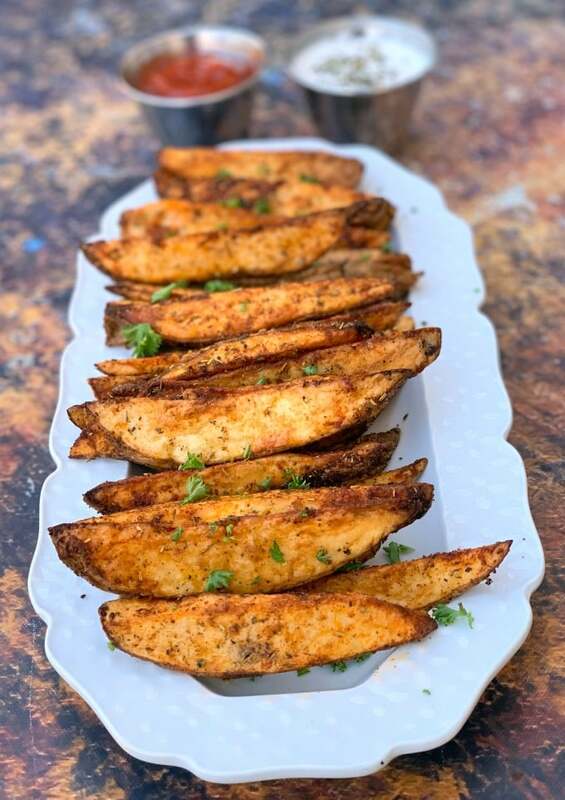 Easy Air Fryer Seasoned Potato Wedges is a quick recipe that uses fresh-cut russet potatoes, Herbes de Provence seasoning, and smoked paprika to produce crispy potato wedges with a soft interior. You can use your Power Air Fryer XL, Nuwave, or any brand for this dish. If you love KFC wedges or homemade French fries, you will love these! 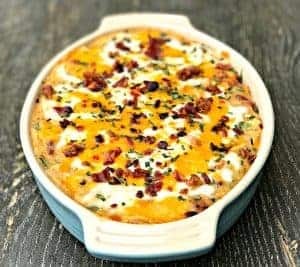 You can also use red potatoes or Yukon gold. 4 medium russet potatoes I went for the potatoes that were the flattest. Wash and scrub the potatoes really well. Cut each potato in half lengthways, then cut the potato on the diagonal to make 8-10 wedges per potato. Try to make sure they are about the same thickness and size. Place the sliced potatoes in a large bowl with hot water. This will remove excess starch and help the potatoes crisp. Leave the potatoes in the hot water for 20-30 minutes. Remove the potatoes from the water and dry them. I used paper towels. Add the potatoes to a large, dry bowl. Drizzle the olive oil throughout and then add the seasonings. Toss with tongs to ensure the potatoes are evenly coated. Spray the air fryer basket with cooking oil spray. Add the potato wedges to the basket. Do not overcrowd the basket and cook in batches if needed. Cook for 12 minutes on 400 degrees. 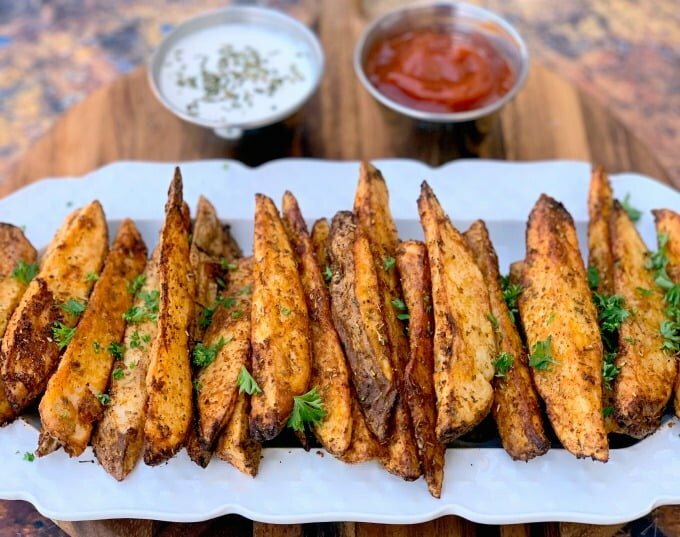 Open the air fryer and flip the wedges with tongs. Cook for an additional 10-15 minutes. Mine were perfectly crisp around 25 minutes of total cook time. Russet potatoes are naturally really bland. Be sure to season well with salt. I topped my wedges with fresh parsley. I love these @ KFC, but these are even better in the air fryer. Seasoning is spot on! 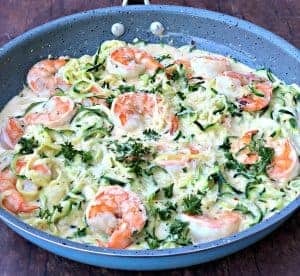 These are so much healthier than fries – I love recipes like this one.